For over 25 years, businesses have turned to us for solutions relating to employee profitability. This is a provable fact, not just a saying. We were an office machine dealer back in the late 60's. We moved on to electronic cash registers in the '70's, and then evolved in to labor related issues, which took us to employee time clocks, where we have thrived ever since. If you are familiar with Niagara Falls, NY, you may have heard of us before we moved south: Great Lakes Office Products. Our attention to detail is what sets www.employeetimeclocks.com apart. We have sat on the boards of directors of many business organizations, and been the worker-bee in many others. We are members of the National Time Equipment Association, plus several chambers of commerce. We have a clean record with the Better Business Bureau, and work hard to keep it that way. We have the experience and business savvy that you truly need. We provide answers, not excuses. Employee Time Clocks is pleased to supply employee time clocks, time clock systems, watchman clocks, and competent technical support to our good Canadian neighbors to the north. You will also find us at www.canadientimeclocks.com and www.canadatimeclock.com We are able to ship to Canada easily, inexpensively, and quickly. The duties are minimal, normally under ten dollars. Think of it this way: We are "just south of the border," in Florida.(!) From our view, we may as well be just one province over. We know the difference between SSI and SSA. We can even say "Saskatchewan" correctly. From the northeastern beaches of Prince Albert Island, to the beautiful Buschard Gardens in historic Victoria, we are happy to work with you. Business in Canada is important to the the economy of territories like Alberta, British Columbia, Manitoba, New Brunswick, Newfoundland and Labrador, Northwest Territories, Nova Scotia, Nunavut, Ontario, Prince Edward Island, Quebec, Saskatchewan, and Yukon. Strong business in Canada also is important to develop metro areas such as Toronto, Edmonton, Calgary, Quebec, Halifax, Winnipeg, Victoria, Vancouver, Ottawa, and more. As business in Canada grows, Canadian businesses use technology to build a profitable business. Employee time clock systems are a large part of that. Electronic time clocks automate the tracking and recording of employee time and attendance. Businesses in Canada can benefit from the computer based timeclock systems, traditional hand punch time clocks, biometric time clocks, card scan time clocks, and more. The business community in Canada turns to us, Employee Time Clocks, for the best products offered worldwide. The time clock systems are of the best quality available and execute with incredible accuracy. . If you ran a web search for employee time clocks Ontario, then you have found us. We are serious about your success. If you ran a web search for employee time clocks Edmonton, then you have found us. We are serious about your success. If you ran a web search for employee time clocks Saskatchewan, then you have found us. We are serious about your success. As business in Canada grows, Canadian businesses use technology to build a profitable business. Employee timeclock systems are just a part of that. Employee Time Clocks are now able to automate the tracking and recording of employee time and attendance. Business in Canada can benefit from the computer based timeclock systems, traditional hand punch time clocks, biometric time clocks, card scan time clocks, and more. The business community in Canada turns to us, Employee Time Clocks, for the best products offered worldwide. Employee Time Clocks finds business in Canada an important part of our business. The time clock systems are of the best quality available and execute with incredible accuracy. Employee Time Clocks offers a popular biometric time system that uses the hand topography biometric technology. One of Icon Time's systems is named HP 1000 (also known as the Hand Punch 1000). We offer the fingerprint biometric time clock systems, hand topography time clock systems, and more. We also offer the Acroprint ATRx Secure PunchIn, which uses the biometric fingerprint verification system. This biometric system consists of software with a fingerprint reader (USB connection). Also look at our Lathem Touch Station Kit for great results. The Lathem biometric system also consists of Lathem's PayClock EZ software with a fingerprint reader. These biometric time systems are of the best quality and offer you a lot of options and choice. Serious business owners in Canada are turning to biometric technology to eliminate buddy punching and to automate the time and attendance duties for their business. If you ran a web search for employee time clocks Canada, then you have found us. We are serious about your success. Employee Time clocks offers our products to Toronto Canada. Toronto business is thriving and we offer our employee time clocks products to Toronto, Guelph, Burlington, Mosport, and other cities in the Toronto Metropolitan region. Toronto business turns to today's time and attendance technologies to alleviate business processes and to automate their systems. 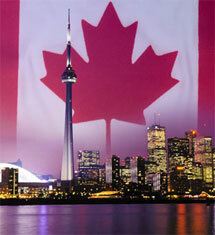 Toronto Canada is a metro area that is surrounded by the beauty of Canada, but is also a strong metro area. Browse our products to see our employee time clocks products sold especially to Toronto businesses. The Toronto business workplace is a professional work environment that can take advantage of the time clock technologies available today. Toronto business utilizes biometric time clocks, electronic time clocks, computerized timeclocks, traditional time clocks and more. We also specialize in offering guard tour and watchman clocks to Toronto business. Employee Time Clocks distributes the best time clock products to Toronto business. Toronto business is a specialty of ours. We sell to Toronto and other Canadian cities like Ottawa, Quebec, and more. We sell to Toronto businesses products with brand names like Detex, Icon Time, Lathem, Pyramid, Acroprint. Simplex, and more. If you have a Toronto business, browse our timeclock products or contact us today. See our product catalog to see biometric timeclocks from makers such as Lathem, Acroprint, and Icon Time. . If you ran a web search for employee time clocks Toronto, then you have found us. We are serious about your success. Let our experience become part of your business advantage. Employee Time Clocks finds business in Canada an important part of what we do. We offer the best products available to not only U.S. companies, but to Canadian companies as well. Employee Time Clocks has been making efforts to meet the time and attendance needs of businesses and workplaces throughout Canada and it's territories. Business in Canada is thriving and Employee Time Clocks aims to be part of the success. It is our goal that every Canadian business that we deal with will be completely satisfied. If you are part of a Canadian business or organization, we welcome you to browse our online catalogue today. Time Clock Systems cut costs and keep employees honest - Biometric systems offer the most accurate time and attendance solution available. Biometric systems eliminate badges and timecards. Employee Time clocks are available for purchase across Canada. Browse our site for more details about our timeclock systems to companies, businesses, and organizations across Canada. The HandPunch 1000 uses RSI's field-proven hand geometry biometrics technology. We sell this and all of our systems to Canada businesses. The terminal captures an image of the hand each time the employee punches. The hand's size and the shape are used to verify their identity with unparalleled accuracy. No fingerprints or palm prints are utilized with this system. It cannot be used for "big brother" applications or abuse. Canada businesses are already taking advantage of this system. There's no question any more; employees have to be there to punch in or out. If they are not there, YOU'RE out of business. Ottawa businesses are taking advantage of the newest employee time clock systems on the market. We carry those systems. If you own a business in Ottawa, browse our cataloge to see what we offer. Our time clocks systems are the best on the market and we find our Ottawa customers an important part of our business. Ottawa businesses and companies and organizations are using timeclock systems like biometric time clocks, computerized time clocks, electronic time clocks, time clock software and more. To our Ottawa customers and other Canadian customers, we also offer systems from makers like Lathem, Pyramid, Icon Time, Amano, Acroprint, and more. Quebec is also an important part of our business and strategy. Businesses in Quebec have trusted our customer service and high quality product line. Businesses and organizations in Quebec use time clock systems to organize their back office operations, increase productivity and more. Quebec Canada business is a thriving and growing market and is very important to us. If you are part of a Quebec business or organization, we welcome you to browse our catalogue and see our products today. If you ran a web search for employee time clocks Quebec, then you found us. ATRx Secure PunchIn biometric system tracks employee hours and offers a reports that will accommodate holiday, overtime, shift and pay-period policies. Secure PunchIn makes time tracking easy, handling up to 50 employees with the option to upgrade to 100 employees. Attendance Rx Network biometric system is an available option that operates on your server workstation. Secure PunchIn offers a powerful biometric software solution for your business. Time and attendance combined with biometric fingerprint verification, it is so easy and affordable. Canadian businesses are trusting biometrics to drive their timeclock systems. eCommerce Website Designer © Employee Time Clocks. All rights reserved.